eDepartment of Neurology (O.K.-H.), Catholic Health System, Buffalo, New York. BACKGROUND AND PURPOSE: Treatment strategies in acute ischemic stroke aim to curtail ischemic progression. Emerging paradigms propose patient subselection using imaging biomarkers derived from CT, CTA, and CT perfusion. We evaluated the performance of a fully-automated computational tool, hypothesizing enhancements compared with qualitative approaches. The correlation between imaging variables and clinical outcomes in a cohort of patients with acute ischemic stroke is reported. MATERIALS AND METHODS: Sixty-two patients with acute ischemic stroke and MCA or ICA occlusion undergoing multidetector CT, CTA, and CTP were retrospectively evaluated. CTP was processed on a fully operator-independent platform (RApid processing of PerfusIon and Diffusion [RAPID]) computing automated core estimates based on relative cerebral blood flow and relative cerebral blood volume and hypoperfused tissue volumes at varying thresholds of time-to-maximum. Qualitative analysis was assigned by 2 independent reviewers for each variable, including CT-ASPECTS, CBV-ASPECTS, CBF-ASPECTS, CTA collateral score, and CTA clot burden score. Performance as predictors of favorable clinical outcome and final infarct volume was established for each variable. RESULTS: Both RAPID core estimates, CT-ASPECTS, CBV-ASPECTS, and clot burden score correlated with favorable clinical outcome (P < .05); CBF-ASPECTS and collateral score were not significantly associated with favorable outcome, while hypoperfusion estimates were variably associated, depending on the selected time-to-maximum thresholds. Receiver operating characteristic analysis demonstrated disparities among tested variables, with RAPID core and hypoperfusion estimates outperforming all qualitative approaches (area under the curve, relative CBV = 0.86, relative CBF = 0.81; P < .001). CONCLUSIONS: Qualitative approaches to acute ischemic stroke imaging are subject to limitations due to their subjective nature and lack of physiologic information. These findings support the benefits of high-speed automated analysis, outperforming conventional methodologies while limiting delays in clinical management. Expert consensus has emphasized the demand for standardization in the acquisition, processing, and analysis of perfusion imaging.15,16 The potential for disparate results and the variability in accuracy among competing software platforms have been the subject of recent studies and were thoroughly expounded in a comparative analysis by Kudo et al.17 In light of recent reports, the primary objective of this study were to examine the predictive performance of several user-defined approaches to NCCT, CTA, and CTP analysis, by comparison with a fast, vendor- and operator-independent computational tool using fully automated lesion segmentation and pixel-wise parametric thresholding for semiquantitation (RApid processing of PerfusIon and Diffusion [RAPID]).18 The objective of our study was to evaluate these tools to determine their ability to predict 90-day favorable clinical outcome in patients with AIS. We retrospectively identified patients with AIS presenting within 12 hours of symptom onset found to have intracranial ICA or MCA occlusion as part of a prospectively collected registry of patients undergoing acute comprehensive stroke imaging with NCCT, CTA, and CTP at Emory University Hospital from February 2011 to December 2013. All patients were initially evaluated by vascular neurology in the emergency setting, with initiation of an institutional stroke protocol facilitating expedited triage, imaging, interpretation, and treatment when appropriate. Patients were excluded from this analysis if they did not successfully complete the comprehensive imaging protocol, had motion or other artifacts rendering imaging nondiagnostic, or lacked data on 90-day clinical outcome. Exclusion criteria further included patients in whom large symptomatic intracerebral hemorrhage developed, among whom measurement of final infarct volumes may be confounded or hindered by resultant mass effect. Retrospective analysis was supported under the guidelines of the institutional review board, and written informed consent was waived for this study. Medical records were reviewed for a clinical history of atrial fibrillation, type 2 diabetes, hypertension, dyslipidemia, and congestive heart failure. Any pre-existing disability (modified Rankin Scale >0) was determined on initial questioning and during review of the electronic medical record. Initial neurologic screening at presentation included determination of National Institutes of Health Stroke Scale score recorded by a vascular neurologist with NIHSS certification. A subset of patients received intravenous and/or intra-arterial thrombolytic therapy per institutional protocol and at the discretion of the vascular neurologist. The modified Rankin Scale was established at discharge and 90 days. A favorable clinical outcome was defined as mRS ≤2 at 3 months. All patients underwent an institutional stroke imaging protocol to include NCCT, CTA, and CTP. CT was performed on a 40-mm, 64–detector row clinical system (LightSpeed VCT; GE Healthcare, Milwaukee, Wisconsin). Helical NCCT (120 kV; 100–350 auto-mA; CT dose index, ∼43.15) was performed from the foramen magnum through the vertex at a 5.0-mm section thickness. In the absence of visible intracranial hemorrhage during real-time evaluation by a radiologist and vascular neurologist, 2 contiguous CTP slabs were obtained for 8-cm combined coverage of the supratentorial brain, obtained at eight 5-mm sections per slab. Cine mode acquisition (80 kV; 100 mA; CT dose index, ∼293.48) permitting high-temporal-resolution (1-second sampling interval) dynamic bolus passage imaging was obtained following the administration of 35-mL iodinated contrast (iopamidol, Isovue 370; Bracco, Princeton, New Jersey) power injected at 5 mL/s through an 18-ga or larger antecubital IV access. Contrast administration was followed by a 25-mL saline flush at the same rate. Last, helical CTA (120 kV; 200–350 auto-mA; CT dose index, ∼38.08) was performed from the carina to the vertex (section thickness/interval, 0.625/0.375 mm) following IV administration of 70-mL iodinated contrast injected at 5 mL/s and followed by a 25-mL saline flush. Follow-up in all patients included either MR imaging and/or NCCT, documenting final infarct size before discharge. All images were transferred to a separate workstation for analysis (Mac Pro; Apple, Cupertino, California) by using a third-party DICOM viewer (Osirix 64-bit; http://www.osirix-viewer.com). CTA Collateral Score and Clot Burden Score. Tan et al9 proposed a rapid, qualitative visual inspection methodology for brain CTA, emphasizing the importance of both the extent of vascular clot (CBS) and the adequacy of surface vascular enhancement, ostensibly reflecting collateral flow response (CS). Two experienced neuroradiologists with subspecialty certification applied visual inspection CTA scores, blinded to clinical and outcome data and all other imaging, specifically as follows: CBS defining clot extent for anterior circulation disease was assigned a score of 0–10, whereby 2 points are deducted for thrombus within each of the supraclinoid ICAs, the proximal 50% of the horizontal (M1) MCA trunk, or the distal 50% of the M1; a single point was then deducted for thrombus within the infraclinoid ICA and the anterior cerebral artery and for each individual vertical (M2) MCA branch.9 As per the original methodology proposed by Tan et al, the thrombus may be partial or complete, with a minimum potential score of zero reflecting extensive anterior circulation occlusion. 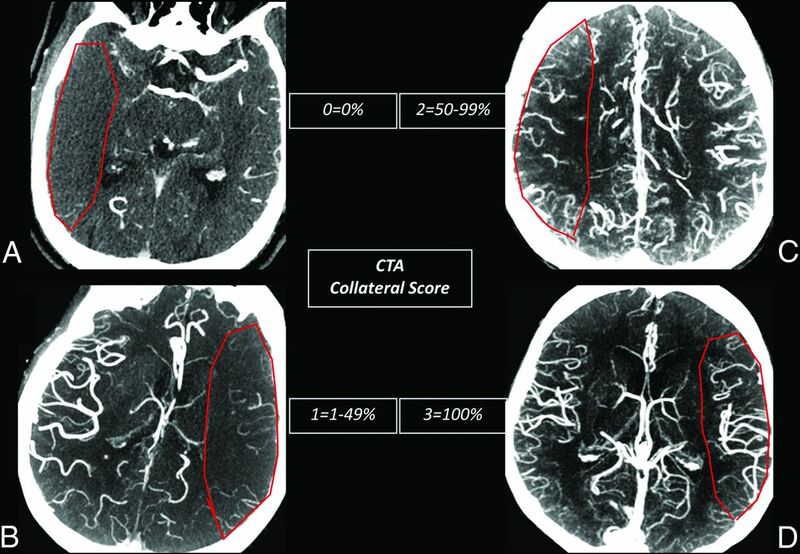 CTA CS (Fig 1) was described as an ordinal, visual grading system for collateral flow, scored 0–3; collateral flow was assigned a score of zero for absent surface collateralization, 1 for >0 but <50% collateral supply, 2 for 50–99% collateral supply, and 3 for normal or supranormal surface vasculature of the MCA territory. CTA analysis was performed by using 20-mm axial maximum-intensity-projection and 0.625-mm axial source images, as well as orthogonal and curved multiplanar reformats as needed. CTA CS. CTA CS methodology as proposed by Tan et al.9 Axial 20-mm maximum-intensity-projection images demonstrate the extent and asymmetry in the peripheral leptomeningeal collateral supply graded as relative to the contralateral normal hemisphere (pathologic MCA territory indicated by a red ROI). A, A score of zero suggests near-complete absence of surface collateralization. B, A score of 1 indicates greater than zero but <50% collateral flow. C, A score of 2 suggests >50% but <100% of normal leptomeningeal collaterals. D, A score of 3 suggests normal or, when present, greater than normal surface collaterals. All perfusion imaging was postprocessed by using a vendor-independent software platform (RAPID). RAPID is an operator-independent image processing and visualization tool operating on standardized DICOM data and configured for entirely automated image processing.18 As an extension of earlier iterations compiled for analysis of MRI diffusion and perfusion imaging, the current implementation further permits CTP postprocessing carried through a computational pipeline similar to that initially described. Briefly, following preprocessing steps correcting rigid-body motion, arterial input function selection is performed and deconvolved from the voxel time-attenuation course using a delay-insensitive algorithm for isolation of the tissue residue function. Time-to-maximum of the tissue residue function (Tmax) is determined on a voxelwise basis, with Tmax maps incrementally thresholded between 4–10 seconds at 2-second intervals, and overlaid upon source CTP data for analysis. Cerebral blood volume maps were computed as outlined elsewhere, and cerebral blood flow was determined in milliliter/100 g/minute.18 Both CBV and CBF have been proposed as estimates of irreversibly infarcted (core) tissues, with past investigations describing both absolute and relative (rCBV, rCBF) thresholds for the detection of infarct core.19 For the purposes of this study, separate estimates were supplied for each, thresholded at relative rCBF or rCBV <30% normal. Color-coded core maps for both parameters were automatically generated and overlaid on source images for review purposes (Fig 2). Processing time from the transfer of perfusion data to the RAPID suite to production of processed maps was approximately 3 minutes. RAPID CTP core-penumbra mismatch. Sample output from RAPID perfusion module. The upper of 2 perfusion slabs (4-cm supratentorial coverage across 8 contiguous 5-mm sections) underwent delay-insensitive deconvolution, normalization and lesion segmentation, and thresholding for the production of infarct core and hypoperfused tissue estimates. Similar analysis was undertaken for the inferior perfusion slab (not shown) and cumulative predicted core and penumbral volumes established for each patient. Default output parameters for infarct core (rCBV <30%, A), infarct core (rCBF <30%, B), and hypoperfused tissues (Tmax >6 seconds, C) are shown. The final infarct volume (not shown) measured 97 mL. CTP analysis lastly included examiner-driven qualitative evaluation of perfusion parametric maps. 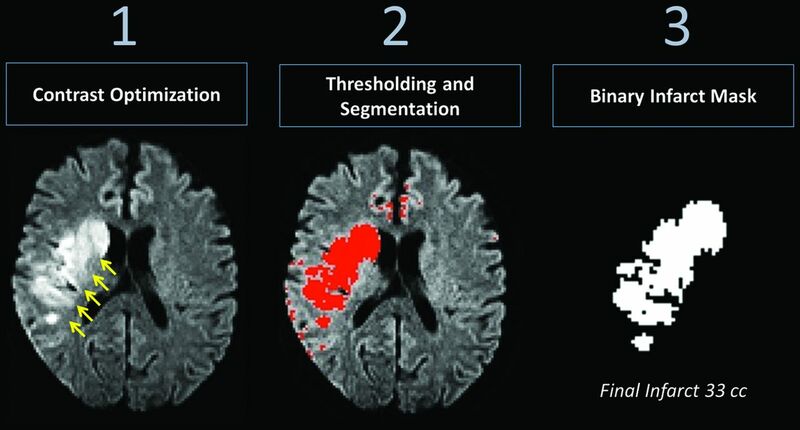 Recent studies have extended ASPECTS methodology to perfusion imaging, reporting both improvements in predictive performance relative to clinical outcome and stronger interrater agreement.10,20 As detailed by Aviv et al,20 CBV and CBF maps were assigned CTP-ASPECTS by the same 2 neuroradiologists, again blinded to clinical and other radiographic data, in separate scoring sessions spaced approximately 7 days from the prior analyses. CTP-ASPECTS again ranged from 0 to 10, with a single point deducted for any of 10 supratentorial regions exhibiting apparent hypoperfusion. The correlation between the RAPID core infarct estimates, CBV and CBF, and final infarct volume was determined independently. Final infarct volumes were measured following export of raw DICOM data to the Fiji release of the ImageJ software platform (http://imagej.nih.gov/ij/). Analysis included a series of postprocessing steps (Fig 3), beginning with optimization of image contrast for detection of hyperintense regions on follow-up trace DWI or CT images. Binary images were generated following application of intensity thresholds permitting voxelwise measures of final infarct volume in milliliters, cross-referenced with original DWI to exclude regions of EPI-related artifacts, such as those near the skull base or air-tissue interfaces. Analysis pipeline, final infarct volume. Postprocessing steps for determination of final infarction volume on follow-up. Optimization of image contrast for intensity-wise lesion segmentation was performed with manual thresholding toward production of a binary image, with cross-reference to the original DWI data to exclude spurious areas related to susceptibility or EPI distortions. Statistical analysis was performed in SAS software, Version 9.3 (SAS Institute, Cary, North Carolina). Pearson correlation coefficients were calculated to assess the relationship between continuous variables (predicted infarct core and final infarct volume). Ordinal (ASPECTS, CS, CBS) and continuous (predicted infarct core volume, at-risk tissue volume, and final infarct volume) variables were considered for the input model of univariate and multivariate logistic regression, against dichotomized outcomes (mRS ≤2) for all patients at 90-day follow-up. Receiver operating characteristics (ROCs) were computed; optimal operating values were established for each variable of interest as discriminators of favorable clinical outcome; and sensitivity, specificity, and confidence intervals were determined. Statistical significance among tested variables as predictors of final infarct volume was determined at P < .05. Interobserver agreement for NCCT-ASPECTS, CBV-ASPECTS, CBF-ASPECTS, CBS, and CS was established by Pearson correlation coefficients. Intraobserver agreement for binary determination of ASPECTS >7 was established separately by κ statistics. Sixty-two patients (36 women; median age, 70 years; range years, 33–94 years) with AIS (<12 hours) and MCA or intracranial ICA occlusion constituted the study population. Among these, 15 were excluded due to severe, unrecoverable motion artifacts (n = 5) or lack of 90-day clinical outcome data (n = 10), leaving 47 patients for analysis. No patients were observed to harbor bilateral arterial occlusions. Median NIHSS at admission was 15 (interquartile range, 16); the mean duration from the time of onset/last known healthy to imaging was 210 minutes. Twenty-three (52%) patients received IV tPA, and 10 (23%) underwent endovascular treatment for intra-arterial clot lysis or retrieval. The mean mRS at both discharge and at 90 days was 3; favorable outcome (mRS ≤2) at 90 days was recorded in 16 patients (34%). An ICA or M1 occlusion was present in 41 (72%) patients, with MCA M2 segment occlusion observed in the remainder. Final infarct volume was measured by DWI in 77% of patients with the remainder established by NCCT; median final infarct volume was 34 mL (interquartile range, 94 mL). Results of adjusted multivariable logistic regression analysis and odds ratios for dichotomized favorable outcome (mRS, ≤2) are presented in Table 1. Patients with favorable clinical outcome at 90 days exhibited higher baseline NCCT-ASPECTS (P = .03). Similarly, significant interactions were observed relative to 90-day favorable clinical outcome for CBV-ASPECTS (P = .01), CBF-ASPECTS (P = .04), and CTA clot burden score (P = .02), but not for CTA CS (P = .09). Among RAPID parameters interrogated, predicted core infarct determined both by CBV and CBF demonstrated significant correlations with favorable clinical outcome at 90 days (P = .01). Estimates of hypoperfusion at thresholded values of Tmax exhibited variable results; statistical significance was observed for the default threshold Tmax of >6 seconds (P = .03) as well as Tmax of >4 seconds (P = .01), but not for the remaining Tmax thresholds. ROC analysis (Table 2) demonstrated the strongest predictors of favorable outcome with RAPID-derived core infarct volumes (rCBV core area under the curve [AUC], 0.86, P < .001; rCBF core AUC, 0.81, P < .001). Among the predicted measures of hypoperfusion and overall at-risk tissues by using thresholded Tmax of ≥4, 6, 8, and 10 seconds, predictive performance for dichotomized favorable outcome was similar (respectively, AUC = 0.80, 0.77, 0.76, 0.74; P < .01); the highest combinations of sensitivity and specificity were observed for Tmax of ≥6 seconds (sensitivity, 77%; specificity, 72%). For both rCBV and rCBF core measures, the threshold with optimized sensitivity (100%) for favorable outcome was 9.2 mL, while the threshold with greatest specificity (100%) was 43 mL. Among qualitative, reader-defined measures, CBV-ASPECTS exhibited the strongest performance (AUC, 0.75; P < .01). Among CTA-derived parameters, CBS was superior to CS; however, sensitivity for predicting favorable outcome was lowest among all measures for CBS, shared only by CBF-ASPECTS (CBS AUC, 0.74; 95% CI, 0.59–0.89; optimal cutoff, 5; sensitivity, 58%; specificity, 77%; P < .01). Performance for NCCT-ASPECTS (AUC, 0.72; sensitivity, 68%; specificity, 68%; P = .01) was comparable with CBF-ASPECTS and CS, but inferior to all automated perfusion metrics. The strongest overall predictive performance toward favorable clinical outcome was observed with final, follow-up infarct volume (AUC, 0.96; 95% CI, 0.91–1.0; optimal cutoff, 29.1 mL; sensitivity, 91%; specificity, 88%; P < .001). Analysis of interrater agreement yielded superior results for CTP- and CTA-derived measures compared with NCCT ASPECTS (Pearson correlation: NCCT-ASPECTS, 0.52, P < .001; CBV-ASPECTS, 0.94, P < .001; CBF-ASPECTS, 0.93, P < .001; CS, 0.85, P < .001; CBS, 0.94, P < .001). Interrater agreement for determination of NCCT-ASPECTS >7 improved (κ coefficient = 0.93, P < .001). Correlation between variables of interest and final infarct volume (Table 3) demonstrated similar results, with the highest correlations among RAPID-derived estimates of infarct core (CBV core r2 = 0.77, P < .001; CBF core r2 = 0.75, P < .001); adjusted logistic regression analyses comparing the odds ratios for final infarct volumes of ≤29 mL (optimal cutoff defining favorable clinical outcomes, above) were similar between the 2 measures (CBV core OR, 1.10; 95% CI, 1.05–1.15; CBF core OR, 1.12; 95% CI, 1.04–1.20; P < .05). Significant correlations were observed between all tested variables and final infarct, with the exception of CBS (r2 = −0.23, P = .11). The results herein support the feasibility of integrating a semiquantitative analytic and visualization tool for advanced CT triage in the time-sensitive domain of AIS. The findings highlight the potential benefits of advanced image processing in this context, whereby enhancements to typically qualitative and sometimes subjective interpretive algorithms were shown to augment the predictive value of acute stroke imaging as it relates to clinical outcome. Two previously proposed CTA-derived measures, the clot burden score and collateral score, were investigated among triage variables in this study.9,11,21 While previously having shown promise as outcome predictors, their ability to supplant tissue-level information provided by perfusion imaging may be limited by uncertainty as to the nutritive capacity of surface-level collaterals vis-à-vis the tissue perfusion approximated by dynamic bolus passage deconvolution with an arterial input function. The importance of leptomeningeal collateral flow in preserving ischemic neuronal substrate and potentially protecting against hemorrhage has been discussed, and numerous multimodal collateral scoring methodologies have been proposed but may lack in their ability to characterize the dynamic nature of collateral flow or discriminate nonperfusion from flow delayed at the moment of acquisition.22 Such vulnerabilities may, in combination, have contributed to the lack of statistical significance observed with CS relative to dichotomized favorable clinical outcome. We acknowledge several study limitations. The relatively small sample population may have impacted the ability to identify significant relationships among some tested variables; however, significant trends among most tested parameters in our study are consistent with the generally strong performance of such approaches in past reports. Within the statistical limits of the study, we believe the findings offer generalizable support for the strengths of advanced, automated computational tools for clinical use. We acknowledge that ROC results in this study may suggest generally stricter and more conservative thresholds for favorable outcome compared with past studies. We suspect that the small sample size and heterogeneity in treatment and revascularization status account substantially for such differences; however, because the primary study aim was establishing the feasibility, utility, and superiority of an automated platform by comparison with user-driven approaches, we do not suspect that these observations have significantly affected the study conclusions. The aims in this study included principally the characterization of varying approaches to predicting clinical outcome. The design and statistical limits did not permit assessment of interactions between study variables and revascularization or tPA administration among patients and, in this respect, cannot specifically be assumed as generalizable to the merits of treatment in such patients. We, however, maintain that within the study aims, specifically to highlight the advantages of robust automation over qualitative analysis regimens in AIS imaging triage, the interaction term relating reperfusion to outcomes is not likely to have influenced the reported results. A larger scale study permitting dichotomization between treated and untreated patients is necessary and is underway for the assessment of such diagnostic approaches as predictors of a beneficial therapeutic effect in AIS. Automated approaches to imaging in AIS may offer some immunity to limitations inherent in qualitative methodologies. These findings support the benefits of high-speed automated analysis in AIS, outperforming conventional methodologies while avoiding delays in management. S. Dehkharghani and R. Bammer were co-lead authors. Disclosures: Roland Bammer—UNRELATED: Grants/Grants Pending: National Institutes of Health*; Stock/Stock Options: I am a board member and hold equity in iSchemaView. Matus Straka—UNRELATED: Employment: iSchemaView; Stock/Stock Options: iSchemaView (minor, <5%). *Money paid to the institution. Paper previously presented in part at: American Society of Neuroradiology Annual Meeting and the Foundation of the ASNR Symposium, May 17–22, 2014, Montreal, Quebec, Canada, as follows: “Reliability and Performance of a User-Independent Platform for Computed Tomography-Perfusion Analysis: Threshold-Derived Automated Systems Outperform Examiner-Driven Approaches to Prognosis and Outcome Prediction in Acute Ischemic Stroke.” Control #2162, Presentation #0–559. Accepted after revision January 20, 2015.